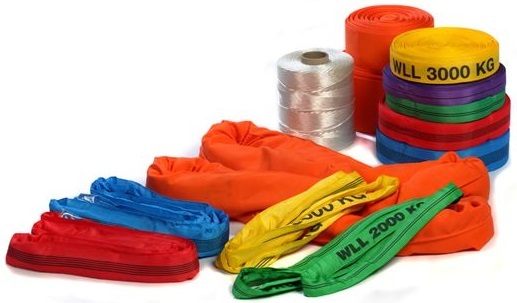 Softstrop polyester endless round slings are manufactured in the UK using only the highest quality yarns, and are supplied with either a single or twin outer sleeve (capacities of 10t and over have a heavy-duty single sleeve). As twin sleeve round slings provide added protection to the inner yarn, we at Sutch Lifting Equipment supply them as standard, should you require the single sleeve version please ensure this is made clear at the time of enquiry/order. Since the introduction of EN 1492-2, round slings have been measured by their length when pulled tight; known as the Effective Working Length or ‘EWL’. Softstrop polyester endless round slings are available in capacities up to 40 tonne and can be manufactured in lengths to suit your requirements. The WLL table (left) provides information regarding mode factors for the most common slinging configurations assuming uniform loading, as general guidance a reduction factor of 50% should be applied to the WLL for non-uniform loading. Please contact our technical team on 01604 751146 should you require further assistance. The table below details the product codes for the more popular sizes of Softstrop twin sleeve endless round slings.